In traditional island style, with modern comfort the BRIGA VIlLAS are waiting for you.They have high quality and tasteful furnishings, with designer lighting, SAT-TV, WLAN, telephone and much more. The living room has 2Sofabeds + a special diningroom (sunroom ) with two stone sofas. A large glass door can be completely opened, so that this room becomes part of the terrace. Of-course we have . Only for the beach you should bring your own towel. Terracce. The Glas door of wintergarden (sun room) can be completely opened, so that he will be integrated in terracce. The Briga Villas (house and studios) are typical of the lokal kycladic Greek architecture. The terraces are open and quite high. No responsibility can be taken for falls. Children depending on their age, are accepted on request. But, in particular, they need to be supervised. Also dogs are accepted on request. We had the most wonderful stay at Briggita’s studio 1. She arranged transportation to and from the airport for us, which was very helpful. I don’t even know where to begin, the views were incredible!!! You don’t even have to leave the place to watch the sunset you have a magical view right in front of you! It was my husband and I that stayed there and we had a perfect amount of space. The dehumidifier and fan was nice to have since there is no air conditioning. The little kitchen and fridge were perfect to have to make little things if we wanted. The town was nice to stay in not as many tourists as Oia. Briggita was also very helpful with restaurants and how to get to bus stops! We enjoyed visiting with her and her dog Leon very much and are grateful for her hospitality. We will definitely be back & would recommend this place to anyone looking to stay in paradise. Lovely & affordable suite central to everything. Brigitta is a charming hostess. Vielen Dank für Ihre Gastfreundschaft! Beautiful artist designed property and some of the best views in the entire Mediterranean. Briga Villas house is located in a very privileged position, in a quiet and secluded section of the "caldera" area of Firostefani that enjoys some of the finest views the island has to offer. It is also a short and spectacular 10-15 minute walk to the centre of Fira, the island's capital with the facilities, museums and other attractions it boasts. Brigitta herself was a charming hostess lovely company and was able to give us first class recommendations for taxis and eating out. I can honestly say that our familiy will never forget this beautiful holiday as long as we live. It would be my pleasure to have you stay at my Briga Villas again. My husband and I stayed at Briga Villas for our honey moon from June 26-July 3. Upon arrival, we were astonished by the location of the villa. We knew the views were great from the pictures, but the pictures did not do it justice!! Within hours of arriving at the villas, the owner (Brigetta) gave us a call on the house phone to make sure everything was alright and ask about our travels. We were also greeted with a bottle of Santorini wine to help us get our honeymoon started. It was so yummy! Our week at Briga Villas was wonderful. The location of the house was perfect. The word "Firostefani" means the “crown of Fira” and it is due to the touristic development of Fira which has pushed the boundaries of the capital. That being said, the city of Firostefani was less crowded but had plenty of nice restaurants, markets, and tour guides in walking distance from our house. This was perfect for us. We would wake up, and walk to get breakfast at a local restaurant. Then, we would use the resources of Firostefani to plan day excursions around the island. Fira (the capital) is also walking distance from the villa. Almost every night, we would walk to Fira and visit the market and grab a bite to eat. The night life in Fira is FUN! The Villa was so cute! Gave us a feel for a tradition greek cave house. The views were unbelievable, the venue was private, and we always felt safe. The locals were also accommodating and friendly. We became friends with quite a few locals, and they were happy to help us as needed. If you are coming from America, please keep in mind that you will need a universal adapter to charge any of your devices. We had never been to Europe, so we did not come prepared with the correct charging equipment. Thank you for your positive review. I agree Santorini is a beautiful place to have a honey moon. I am glad that you found the Briga Villas perfect for you. I hope you can return some day. It would be my pleasure to have you stay at he Brigas Villas again. Your Holiday of a Lifetime Starts HERE!! This is a MUST to be on your bucket list! Stay here and experience the true beauty of Santorini. We stayed with Briga for six evenings! Spectacular views! No need to go to Oia for the sunset, easy access to great restaurants. Far enough away from Fira that you get few tourists from the cruise lines. Local restaurants include Simone's and "Why Not Gyro?" - (grab a gyro and a bottle of wine and then walk three minutes back to the Villa to watch the sunset!!! The entire place is well maintained and simply immaculate!! We stayed in the house, fully stocked kitchen that we never needed to use, large living space, the outside dining glass room is amazing, the bedroom is spacious. Briga herself is a wonderful good hearted woman. She was responsive, welcoming and extremely helpful. We are a couple from the US in our 50's and were made to feel welcomed as special guests and family members. We are quite meticulous and simply could not find a fault with Briga Villas, Fiorstefani and Briga. This is my first ever review, we can't say more than.......This is a MUST stay!!! Now I found your lovely review from last year . 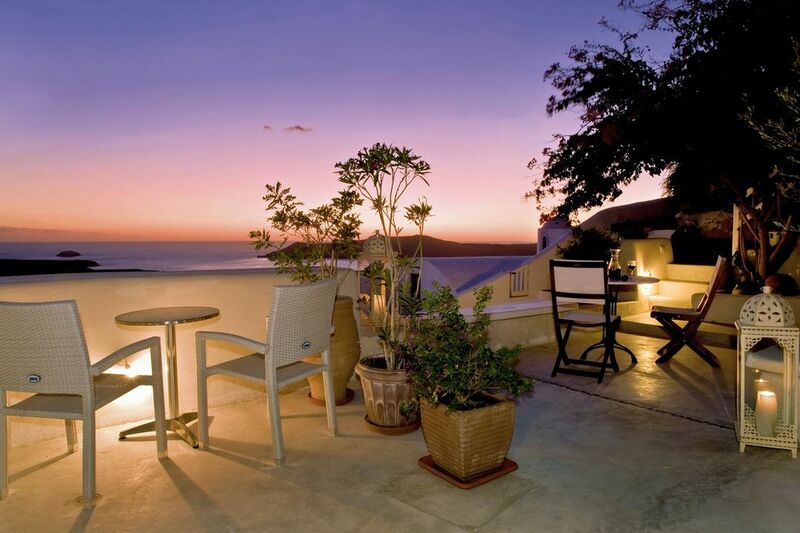 IF YOU RETURN SOME DAY TO SANTORINI I WOULD LOVE TO HAE YOU STAY IN THE BRIGA VILLAS AGAIN. FRAGEN SIE NACH SONDERPREISEN Z.B. BEI FRÜHEN BUCHUNGEN ODER LÄNGEREN BUCHUNGEN. BUCHUNGEN FÜR WENIGER AS 1 WOCHE, WENN NÄCHTE FREI ZWISCHEN ZWEI BUCHUNGEN BEI MEHR ALS 2 PERSONEN (DRITE UND EVTL. VIERTE) JE € 25 PRO NACHT IN VSAISON, € 30 PRO NACHT IN H SAISON, € 15 PRO NACHT IN WINTER SAISON.